This was our first website design for a municipality and we couldn’t have been more excited about it. What’s great is that we were selected over other qualified bidders with a unanimous decision – it really meant a lot to have the town officials’ confidence in us and we wanted to do our best work! 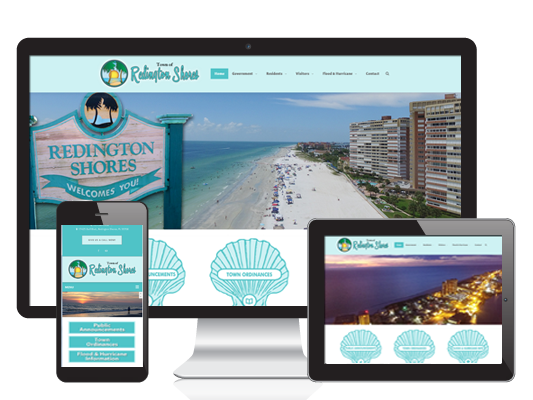 Redington Shores had an old, out-dated website that wasn’t mobile-friendly and wasn’t that easy for users to navigate through. We created a responsive custom WordPress website for them where they can easily post Public Announcements to keep the residents informed of the latest, post events for meetings and gatherings, get the residents to sign up for their email news, quick links to many helpful resources, and much more! What’s even better, because of our familiarity and previous work with Floodplain Management websites, we were able to design the site and include the necessary content in order to get them points to save them money on their flood insurance rates!